Three Men Make a Tiger is a Chinese Idiom ("San Ren Cheng Hu" in Chinese pinyin). 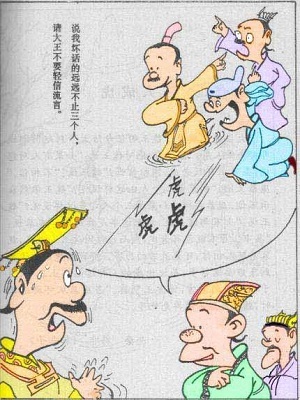 There is a story behind this idiom recorded in the Chinese history book Zhan Guo Ce. During the Warring States period (about 5th century BC) in China, seven prominent states battled each other and sometimes made alliances. One year, the state of Wei allied with the state of Zhao. To ensure this alliance, the two states had to exchange princes as hostages. Pang Cong, the minister of Wei, was chosen to accompany the prince of Wei to go to Zhao. He was worried that his political opponents would speak ill of him while he was away. So he came to the king of Wei, saying, "Your Majesty, if someone were to tell you that there was a tiger running in the street, would you believe it?" "If two people were to tell you there was a tiger running in the street, would Your Majesty believe it? " "I might suspect it, " the king said hesitatingly, "but I wouldn't believe it. " "What if three people were to tell you that?" After thinking for a while, the king said, "Yes, I would." Pang Cong said, "Your Majesty, it is for sure no tiger is running in the street. But after being told by three people that there was one, you would believe it was so. Now I'm going to Han Dan (the capital of Zhao) far away from Da Liang (the capital of Wei). There will certainly be more than three people speaking ill of me in front of you, and I wish that Your Majesty would give it your discernment." The king said, "Yes, I will." However, after Pang Cong left, the king believed the slanderous gossip about him and no longer trusted him. Later, Chinese people use this idiom "Three Men Make A Tiger"--San Ren Cheng Hu to describe the case in which a lie, if repeated often enough, will be accepted as truth. "What everybody says must be true" is close to its meaning. Chinese Idiom: Three People Make a Tiger - San Ren Cheng Hu. Suspect The Neighbor of Stealing An Axe. Chinese Idiom Yi Lin Dao Fu. The Blind Men And The Elephant. Chinese Idion Mang Ren Mo Xiang.